What could be better than a weekend at the Grandparents? Where I don't have to cook (not even allowed in the kitchen! ), do laundry (no sooner do we have our clothes off our bodies before my Mom snatches them up, wash, dries, folds, and returns them to our room), or get up early with the kids (we just shoo them out of the room, roll over and sleep at least until double digits on the clock... every parent's dream!). And it isn't just Michael and I who benefit. The grandparents get to spend hours listening to Nathan's ideas or being led around the property by Benjamin. 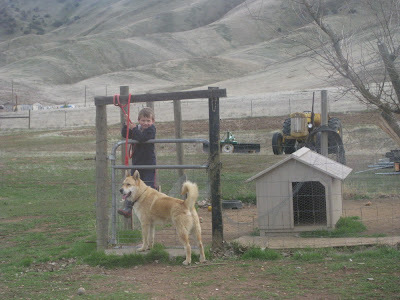 And the boys get to explore acres of dirt (or mud as it was this weekend), climb on farm equipment, chase chickens, and get chased by the overgrown puppy, Mack. It's a win-win situation for all of us. On Sunday Benjamin brought me my shoes and asked me to come with him and "picture him" around the property. So I did, and this is what we ended up with. 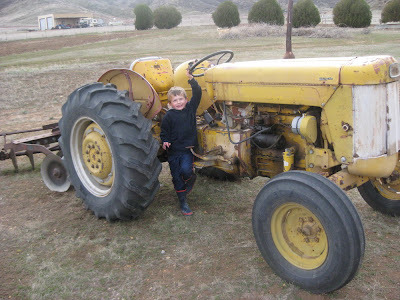 Here's Ben with the Massey Ferguson tractor. When I first heard the name "Massey Ferguson", I wished it was my name. I was disappointed to find that it's just two last names of the founders of the tractor company, with roots back in 1847. This tractor is LOUD! Nathan won't go anywhere near it! 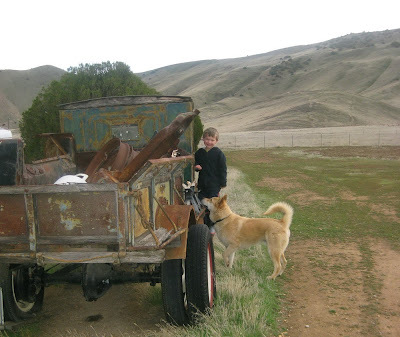 Ben on the Model AA Ford truck, with beautiful blond puppy Mack. Ben on top of the Model AA, to get away from puppy Mack's kisses. Ben inside puppy Mack's pen, while Mack patiently waits for him to come out to play. 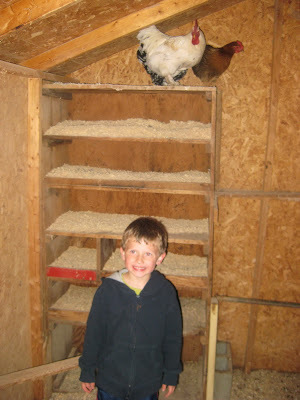 Checking the chicken coop to see if the girls left any eggs for our breakfast. No, they did not. 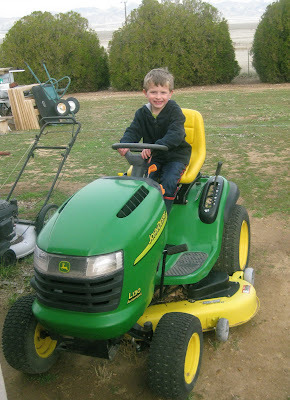 Benjamin on HIS tractor. Last year he declared emphatically to my Dad that this was HIS. 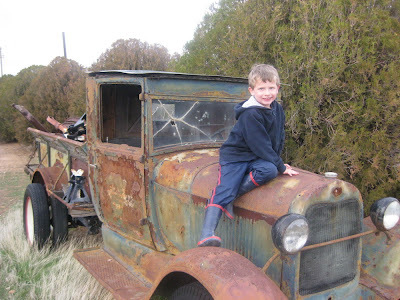 Of course, Grandpa lets him drive it all over the property. Lucky little five year old, I didn't get to drive a tractor until I was 11!